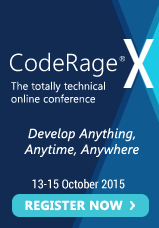 CodeRage X is almost here! Are you registered? CodeRage® X is heating up with fresh development techniques and deep dives that will get your apps ready for Windows 10 and theInternet of Things! Don’t miss out on this FREE online Delphi® and C++ Developer Conference.